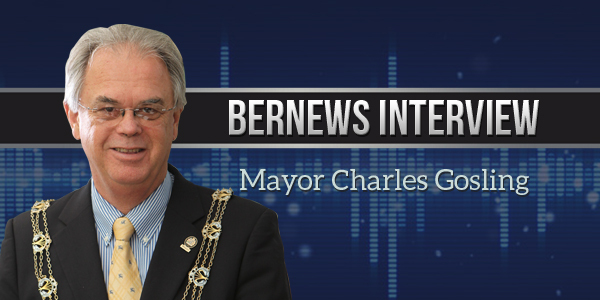 Hamilton Mayor Charles Gosling is speaking with Bernews this afternoon [April 3], sitting down for a live interview with journalist Jeremy Deacon, and you can tune in and watch below. WE ARE ALL IN THE SAME BUSINESS OF SURVIVAL. I have often mentioned “DOUBLE DIP” when it comes to taxation. As i see it,the C of Hamilton is no different than all the others, can some one tell me how you can pick up trash in the city once and pay for the service twice to two differnt masters. …………. Wake up ! The residence of the City of Hamiltion are paying taxes which is equivalent to Bermuda Goverment land tax fees. You do not need me to tell you that the cost of living in this country is beyond ridiulouse as we see increases in fees, cost of services etc, constantly , yet steadily increasing in “drips and drabs” never the less we see an irreversible nickle and dime increase every where . You would have throught increased in efficiently would reduce the cost of doing business yet we pay more the the same as before . There is alot of” Hanky Panky” going on here, at all levels. Government uses taxes to control our very existance . Are we to be branded as inaficient and lazy nation. My friends in the USA will not come here , saying, the island is too expensive , can’t blame the cost of product importation because they import over 600 milese as we do. We have not learnt that half a cake is better than no cake. Where are the incentives ? ALL WE HAVE TO OFFER IS SERVICE. We need to look at who and what is cutting our throats is it excessive profits, taxation, freight charges,insurance charges, labor fees, the dollars are going some where , but not here two Bermudas. Why are my friends leaving this country ? A brain drain for sure ! May be they have had enough ! If SAGE did not work ! what would work ? Depriving a person of a half way decent life can creat discontentment. Increased efficiency would some how be a better way of doing business, for that failure we can blame inafficient management as they are part of the team also. They are diging our grave, eventualy the big wheel will grind to a hault as every one playing the game finds ways to increase the cost of living with a corresponding loss of productivity. You can not blame the office mail person. Its not my job ! When the ship is sinking every body bails.